The SmartPower™ range of single use surgical micro power equipment is revolutionary, providing a real and cost-effective solution to spending vast amounts on re-usable power tools. Hospitals need suffer no longer with the costs involved in re-sterilising, maintenance, shipping, not to mention the costs of cancelled surgery due to equipment 'downtime'. We offer a real solution with sterile 'fresh out of the box' equipment that offers the same (if not better) quality, no complex equipment set up and a fresh, reliable tool for each surgery. These tools will be available from April 2011. The SmartPower™ Micro Oscillating Saw is ideal for use in orthopaedic osteotomies and other bone cutting procedures. Supplied in a sterile package the saw is lightweight, allowing for optimal manoeuvrability and minimising wrist fatigue. It also features a Linvatec type locking hub which accepts standard oscillating saw blades. 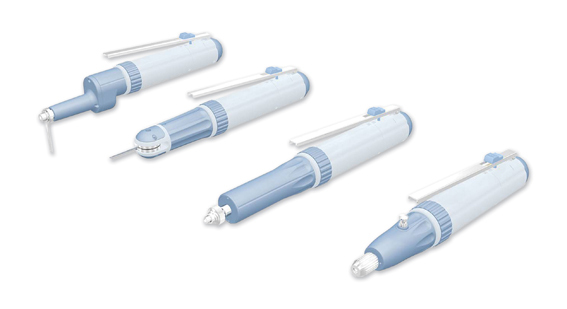 Designed for drilling and screwing in a variety of reconstructive and trauma procedures, the SmartPower™ Micro Drill features a cannulated channel for placing pins and guide wires. It is provided with a keyless chuck and is pre-sterilised and ready to use. Designed for use when performing vertical osteotomies and other bone cutting procedures, the SmartPower™ Reciprocating Saw comes pre-sterilised and accepts Linvatec style reciprocating saw blades. Designed for use to perform vertical osteotomies and other bone cutting procedures, the SmartPower™ Sagittal Saw comes pre-sterilised and accepts standard Linvatec style blades. The SmartPower™ Micro Tool Power Console is a portable electrical power source for the operation of the SmartPower™ range of hand held surgical micro power tools. It is a corded unit which runs off mains electricity and has three connectors located on the front panel to which three SmartPower™ Micro Tools can be attached at any one time. However only one hand held device can be operational at any one time. For more details about our range of Single Use Micro Power Tools please e-mail robert@orthopaedicinnovation.com or call our office on +44 1909 550869.